Not to be confused with The Woods Band. Woods is an American folk rock band from Brooklyn, New York, formed in 2005. The band consists of Jeremy Earl (vocals, guitar), Jarvis Taveniere (various instruments, production), Aaron Neveu (drums), Chuck Van Dyck (bass), and Kyle Forester (keyboards, sax). The band's former bassist, Kevin Morby, left the band in 2013. Woods have released nine albums, the latest being Love Is Love. Pitchfork Media reviewed one of their previous albums, Songs of Shame, giving the band its "Best New Music" designation and describing the sound as "a distinctive blend of spooky campfire folk, lo-fi rock, homemade tape collages, and other noisy interludes, all anchored by deceptively sturdy melodies." 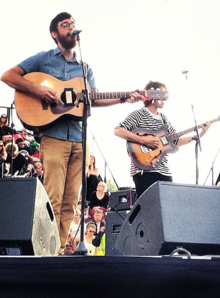 Singer-guitarist and founder Jeremy Earl also runs the rising Brooklyn label Woodsist, for whom the band releases their work. ^ Kreps, Daniel; Weingarten, Christopher; Doyle, Patrick (15 June 2015). "50 Best Things We Saw at Bonnaroo 2015". Rolling Stone. ^ Charlesworth, Jenny (August 27, 2009). "Woods offers a taste of the Brooklyn sound", The Georgia Straight. Retrieved on 2009-09-03. ^ Sabbath, Chris (August 27, 2009). "Woods: Reworked quartet's 'Songs of Shame'", San Francisco Chronicle, p. F4. Retrieved on 2009-09-03. ^ Murphy, Matthew (April 24, 2009). "Woods: Songs of Shame", Pitchfork Media. Retrieved on 2009-09-03. ^ ""Rain on Radio" | Forkcast Archive". Pitchfork. 2009-07-06. Retrieved 2012-10-03. Wikimedia Commons has media related to Woods (band).